Could sighting be Utah&apos;s first wolf pack? Wildlife • 4 animals spotted Sunday might be wolf-dog hybrids. Utah wildlife officials are investigating whether four large canines that a state coyote-control crew spotted roaming eastern Utah County on Sunday might be Utah's first confirmed wolf pack in generations. The crew flew by helicopter over the mountains east of Springville looking to shoot coyotes when they spotted what they concluded were either wolves or wolf-dog hybrids, Division of Wildlife Resources Wildlife Section Chief Kevin Bunnell said Tuesday. If they are pure wolves they would represent the first confirmed group activity among wolves in Utah, likely emanating from populations in Idaho or Wyoming. They would also be protected as endangered species, because they're south of Interstate 80 and outside the sliver of northern Utah that federal officials count as part of the recovery zone where northern Rocky Mountain wolves were removed from the endangered list. "If they're wolves," Bunnell said, "then we kind of step aside to a certain extent [because] they are under the authority of the [U.S.] Fish and Wildlife Service." A wildlife-trapping crew under contract with the state plans to search for the animals later this week after a predicted snowfall that will make them easier to track. If successful, the crew will tranquilize the animals and draw blood for DNA testing, then release them and track them by radio collar. If they prove to be hybrids, the state could kill them. 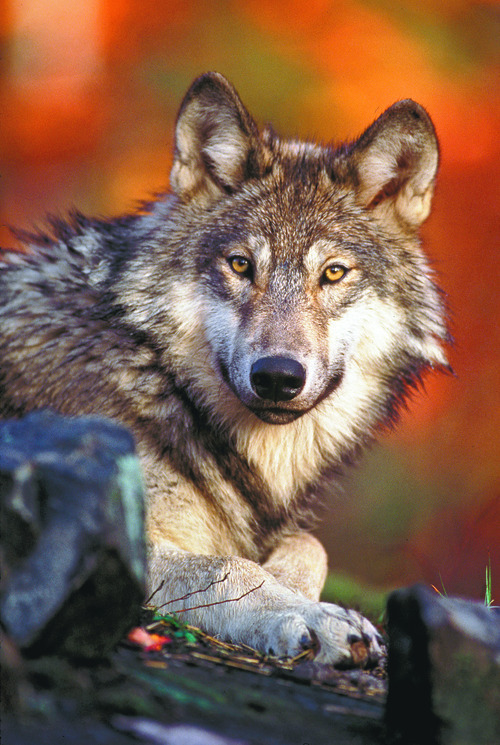 If they're wolves, state law requires the division to ask Fish and Wildlife to remove them  but at federal discretion. "There's no good reason to remove them," said Kirk Robinson, director of the Salt Lake City-based Western Wildlife Conservancy and a supporter of Utah wolf recovery. He doubts federal biologists would grant the state's request, given the animals' endangered status here. "They belong in the ecosystem," Robinson said, "even if it's inconvenient for some people or causes some distress." If successful, this week's seek-and-capture mission would add new urgency to what has been largely a hypothetical  though passionate  political war in recent years. Utah lawmakers have directed state biologists to do everything in their power to prevent pack formation until wolves are removed from the endangered list statewide. Last year the head of the Utah Department of Natural Resources called livestock- and deer-munching wolves "biological weapons." The Utah Senate is considering a bill to create a wolf-hunting permit, though such killings could not take place unless federal protections are removed. 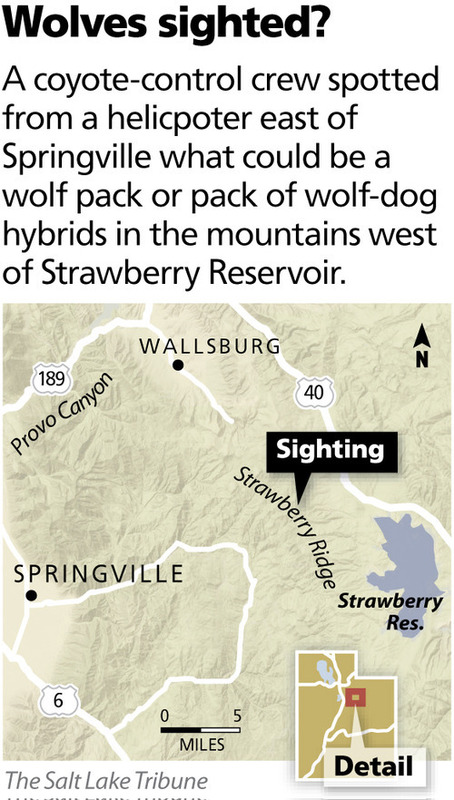 The sightings come in the same area of Utah and Wasatch counties  generally near a wrinkle in the Wasatch Mountains called Strawberry Ridge  where hunters and ranchers have reported seeing wolves and one possibly wolf-killed calf in the past 18 months, Bunnell said. Division biologists also have found tracks apparently too large to be anything other than wolves or hybrids and have set camera traps in an attempt to document their makers. A couple of facts support the theory that the animals are hybrids, Bunnell said. One is simply that Utah County is farther south than biologists would expect to find a first Utah wolf pack. Another is that some of the tracks found in the area were intermingled with coyote tracks, when wolves and coyotes generally don't mix in the wild. If they are wolves, they could indicate that a genuine population is building in the Beehive State. Frequent sightings of individuals are reported throughout the state, but biologists generally caution that lone wolves wander widely with little chance of making a long-distance mating connection. "We know we've had wolves coming in and out of the state at different times," Bunnell said. "The fact that there's four kind of raises the bar." News of the possible pack should motivate ranchers to notify state biologists of wolf sightings, Utah Farm Bureau Federal Vice President Sterling Brown said. "Utah's ranchers are concerned with the continued sprawl of wolves out of the greater Yellowstone area." Any wolves roaming most of the state are covered by Endangered Species Act protections, he acknowledged, but state officials can be helpful persuading federal biologists to trap and move animals that harass livestock.